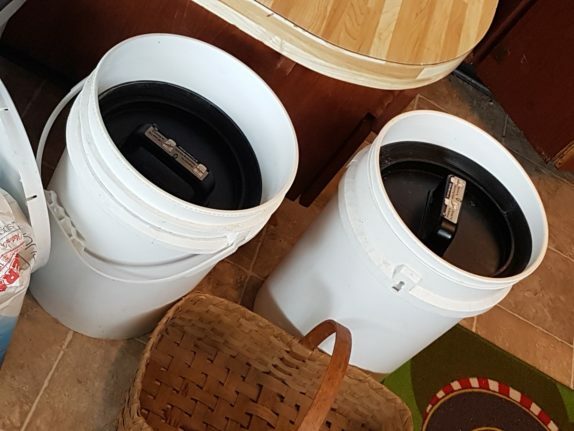 The lid can be pushed down all the way to the level of the bucket contents, minimizing oxygen exposure to a very low level. Don’t be fooled by the product’s name “Airscape.” Air does not escape. Not unless you want it to, at least. To make air escape in either direction, you press a trigger mechanism inset into the bottom of the handle. The trigger mechanism is no dinky little button. Its satisfying chunkiness extends along the entire width of the handle and you can tell that whatever spring mechanism holds it in its normally open position was crafted with care and a passion for fine trigger mechanisms. I’ve been begging the supplier to list his fine lids on Amazon so that this humble bucket journalist can collect a tiny fee for each unit sold, which will allow me to keep this scrappy bucket blog open just a little longer. He assures me that this is part of the long-term strategy. Until then, it seems as if the product is available on his website, alongside peewee-sized airscapes to preserve the shelf life of such vices as coffee and sugar. George in California wrote me, representing his fermented hot sauce business. He has been searching high and low for a lid with an inset one-way blowoff valve to apply to his fermentation vats. He presented me with a long list of requirements to meet his unique needs. Yes, I told him, just use a homebrewing bucket with a dinky little airlock stuck into the top. I even sent him some links and pictures. George must have sighed and shook his head at my naive response. George was already using that exact method and the problems he was having with it prompted him to reach out to me in the first place. Chief among his woes was his compounding struggle against limited physical space. Each dinky airlock demands an extra 4 vertical inches of precious factory space, and production efficiency was plunging as a result. In a desperate move I presented him with the Airscape leaflet I received from Jess from Planetary design. To my surprise, he was elated with the recommendation. He actually used the word “incredible” in his response. I breathed a sigh of relief. 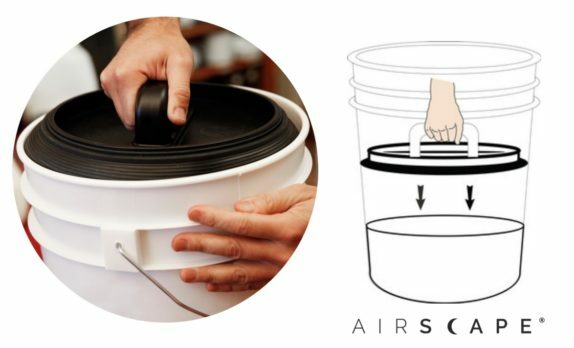 Jess and his Airscape had saved me from an embarrassing failure in my role as bucket advisor on this website.